A federal appeals court in California has ruled that Americans don’t have an automatic right to carry concealed weapons in public under the Second Amendment. The ruling upholds a law requiring people to have “good cause” to be granted a concealed carry permit. This is sad news for people who badly want to take their guns to Chipotle with minimal paperwork. 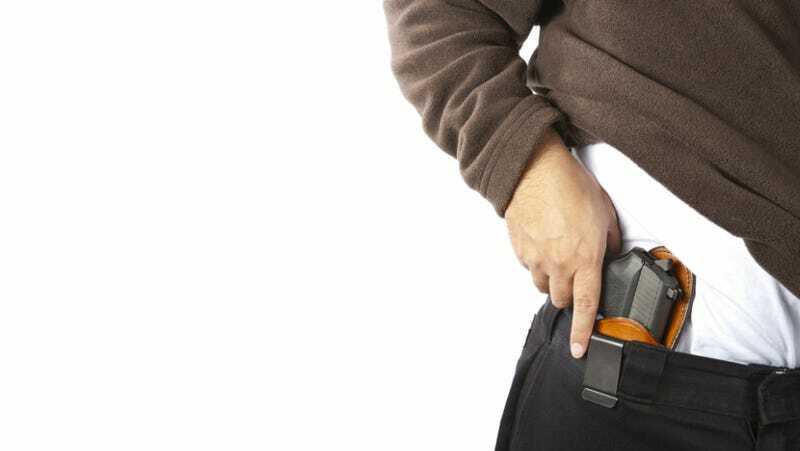 The Second Amendment may or may not protect to some degree a right of a member of the general public to carry a firearm in public. If there is such a right, it is only a right to carry a firearm openly. But Plaintiffs do not challenge California’s restrictions on open carry; they challenge only restrictions on concealed carry. Fletcher said that state lawmakers are free to enact “any prohibition or restriction a state may choose” on concealed weapons. Given that the ruling was handed down by a court in San Francisco, of all places, and given that it affirms even the lightest restriction on gun ownership, prepare for a full-scale freakout any second now. This post has been corrected and updated to more clearly explain California’s “good cause” laws.